When you’re readying your pack for the trail, it’s the lightweight, efficient, and powerful items you want to include. Being off the grid and miles away from home and modern convenience is no place to be to take a risk on products that might not deliver in your hour of need. Perhaps one of the most important pieces of gear you’ll ever choose is a portable stove system, and when it comes to stove systems, it doesn’t get better than the performance of the MSR Reactor Stove. Introduced by Mountain Safety Research (MSR) in 2007 after decades of testing and developing outdoor stove systems, the reactor stove system integrates a radiant burner fully enclosed by cookware. The reactor stove system can boil water in record time, and is incredibly wind-resistant, lightweight, compact, and reliable. The reactor stove can even be hung to accommodate climbers on a wall; it was famously used by Tommy Caldwell and Kevin Jorgeson when they climbed Yosemite’s Dawn Wall in 2012. All in all, it doesn’t get more efficient than the MSR reactor stove, and today we’re going to examine what makes this particular item so incredibly special, and also take a look at some other systems for the sake of comparison. This MSR reactor review won’t just sing the praises of the popular item itself; we will also provide the comprehensive information you need when it comes to choosing the best stove system for you. Unrivaled Boil Time: Boiling 0.5 liter of water in just 1.5 minutes. Unmatched Wind Protection: Heat exchanger completely encloses radiant burner head, virtually eliminating the effects of wind. Maximum Efficiency: Fuel-sipping efficiency in all conditions. Compact: All systems are self-contained, fitting the stove and fuel inside the pot. Coming from the experienced minds at Mountain Safety Research, the MSR Reactor Stove System gets consistently high marks across the board from users who have taken it on all sorts of outdoor adventures. Retailing at around $220.00 USD, it’s definitely an investment for the serious backpacker, camper, or climber, but the MSR reputation that comes with this stove system ensures that you are getting what you pay for: namely, quality, performance, and durability. The technology behind this popular stove is what keeps consumers happy (and well-fed), and thanks to MSR’s reputation for extensive out-in-the-field testing, you can be sure that this stove has logged many hours being bounced around in backpacks and fired up on chilly mornings to produce hot breakfast in less-than-ideal conditions. Out of the box, you will receive the pot, stove, straining lid and the cloth stove protector. Once fully assembled, the entire system measures 7 x 8 x 8 inches and weighs only a little more than a pound. The Reactor comes in the Liter variants which are: 1.0 L, 1.7 L, and 2.5 L. Unfortunately, it doesn’t come with its own fuel canister and must be purchased separately. Made of high-quality steel and aluminum in Seattle WA, the MSR Reactor Stove features an integrated design: the stove element and cookware are combined to create an entirely self-contained system that’s a breeze to use on the go. Both stove and fuel can be stored inside the 1.7-liter pot, and the collapsible handle locks the transparent lid in place when it’s time to stop cooking and start trekking. Being able to nest the pieces of the stove inside each other is key when it comes to maximizing space in your pack; it should be noted that the fuel canister is only guaranteed to fit in nesting fashion when it is the MSR brand IsoPro fuel canister. Fuel canisters from other manufacturers will work fine with the stove unit, but MSR can’t guarantee that they will fit so neatly when it comes time to pack up and move along. You won’t find a more compact reactor stove that packs this much power: at 1.09 pounds, the MSR Reactor Stove System is a barely-there addition to your pack. Clocking in with dimensions of 7 x 8 x 8 inches, it’s been designed to take up as little room as possible while not sacrificing its tried-and-true performance. It isn’t the very lightest system we will review in this article, but those extra ounces are balanced out by the high quality of this reliable stove. The MSR Reactor Stove System requires an isobutane/propane fuel canister that IS NOT included with the purchase of the stove. MSR offers its own specially-designed IsoPro fuel canister for the reactor stove that fits down inside the pot for storage. Users note that most other backpacking stoves use a 70/30 blend of isobutane/propane, but that MSR’s 80/20 isobutane/propane blend performs much better at higher altitudes and in extremely cold conditions. MSR touts its reactor stove system as the “most fuel-efficient all-condition stove system,” and the test results speak for themselves. The MSR Reactor Stove outperforms the competitors when it comes to fuel efficiency; MSR’s signature patent-pending radiant burner, heat exchanger, and internal pressure regulator work together to give you “fuel-sipping” efficiency for the entire life of the fuel canister, no matter where your travels take you. You will yield an impressive 80 minutes of burn time out of just one 8-ounce MSR IsoPro fuel canister, allowing you to do the math before you leave home so that you can determine exactly how much fuel you’ll need to last throughout your adventures. MSR’s Reactor Stove blows away the competition in this area as well, taking only three minutes to boil an entire liter of water and only a minute and a half to boil a half liter. MSR’s extensive lab testing has proven its stove’s rapid boiling ability time and time again over its marketplace competitors. Quick boil time might seem unnecessary to amateurs who assume that being out in the wilderness means time has no bearing on your day, but when you need hot food or coffee and you need it now (and you don’t want to spend an entire canister of fuel to get it), being able to heat water in a matter of minutes is the difference between choosing one stove system over another to an experienced (and intelligent) consumer. The MSR Reactor Stove’s radiant burner head is completely enclosed by the heat exchanger, meaning that a windy day won’t stop you from keeping your boil rolling. While other stove systems require the use of a separate wind shield to keep the fuel lit, the Reactor Stove has things (literally) covered, allowing you to continue prepping other elements of the meal without having to check to make sure the fire hasn’t been snuffed by the wind. Users confirm that the MSR’ Reactor Stove’s wind resistance is the real deal, and you know you can believe a person who has managed to cook a pot of much-needed steaming hot soup on a miserable, blustery mountaintop. At approximately $200 price tag, the MSR Reactor Stove is certainly the not the cheapest cook system. However, considering its performance in extreme conditions and boil time clearly outpaces competing stoves in the same price range, it’s a system that offers a lot of value for your investment. The Reactor is also highly efficient in terms of fuel consumption so that’s more savings coming your way. Buying from the experts at MSR is never a gamble. Like most of their products, the MSR Reactor Stove System is covered by a limited lifetime manufacturer’s warranty. If your stove system is in need of repair, you can contact the MSR Repair Shop in Seattle at 1-800-245-2992, and a trained technician will guide you through the process, determining whether a repair or replacement is in order. 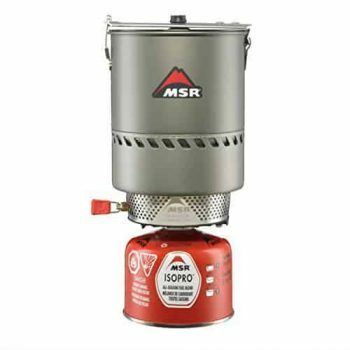 Though—judging from the above—you might not think you need to look any further than the MSR Reactor Stove System for a compact, efficient, and high-performing backpacking stove, there are always exceptions when it comes to everyone’s individual needs, and everyone has their own favorite tried-and-true gear. We’ll take a look at some of the other high-performing stoves on the market that you will want to consider when choosing which one is best for your personal adventures. Important points to consider are weight, dimensions, and—of course—price: you don’t want to sacrifice quality in the name of a bargain, but you also don’t want to break the bank when it’s not absolutely necessary. The minds at Mountain Safety Research are responsible for this incredibly efficient one-liter stove system, which—like the MSR Reactor Stove System—has an enclosed radiant burner to protect against the strong, bitter winds of the winter backcountry. Features of this stove system include the signature MSR radiant burner, a secure connection with the stove unit, a pressure regulator to ensure consistent performance, an insulated cozy with handle for easy eating and drinking, a folding canister stand, a full size 16 ounce (.47 liter) bowl, and a lid that comes complete with drinking and straining ports to suit your every culinary need. 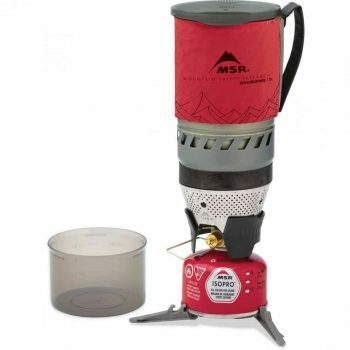 MSR stresses that this stove system is ideal for the needs of solo travelers who are looking to add convenience and efficiency to their adventures without any extra bulk; just like the MSR Reactor Stove System, the MSR WindBurner Stove System nests neatly inside the pot for easy storage and packing. This stove system works with MSR’s own 4 ounce ISoPro fuel canister, which IS NOT included with the unit. The internal pressure regulator (which guarantees consistent performance no matter the conditions) and the enclosed design ensure that even if the wind is whipping, your stove will stay lit and your food and drink will continue cooking. Also included with this unit is a folding canister stand that keeps the MSR WindBurner from tipping over when the winds get to gusting. With dimensions coming in at 9 x 5 x 5 inches and a weight of just one single pound, this stove is compact and lightweight enough to be carried in even the smallest hiker’s pack. The MSR WindBurner stove is made in America with imported parts, and is compatible with additional MSR brand cookware including the WindBurner Coffee Press Kit, the WindBurner Skillet, WindBurner Accessory Pots, and the WindBurner Hanging Kit for those adventurous (and hungry) climbers. This stove system typically sells for around $140.00 USD—much cheaper than the MSR Reactor Stove System—and seasoned adventurers have deemed this be an appropriate price for the value. Judging by the way things have stacked up so far, you may think that Mountain Safety Research has a monopoly on the backpacking stove business, but the innovative folks at Jetboil have equally impressive products, and a fan base to match. The Jetboil Flash Personal Cooking System is one of their consumer favorites, and its performance in the backcountry definitely lives up to the showy product name with which it was bestowed. This particular cooking system features an adjustable burner with push-button through-cup igniter, a one liter FluxRing cooking cup, an insulated cooking cup cozy with a color-change temperature indicator, stabilizer tripod, and insulated drink-through lid and bottom cover. The Jetboil boasts that it can bring two cups of water to a boil in a mere two minutes, thanks in part to the insulated, hand-anodized aluminum cooking cup, which connects directly to the burner with the signature Jetboil FluxRIng, ensuring that minimal loss of heat occurs while cooking. Wind resistance is guaranteed thanks to a built-in windscreen, and the neoprene-insulated cooking cup will keep your food and drink toasty for as long as possible after the fire is out. A sip-through lid further promotes heat retention for the cup’s contents, and the protective plastic bottom of the cooking cup can be removed and used as a smaller, additional bowl or measuring cup. Like the two MSR stove systems, the Jetboil Flash Personal Cooking System can be efficiently nested inside the FluxRing cooking cup for compact and easy storage. This stove uses a 3.5 ounce Jetpower fuel canister, which IS NOT included with the stove system unit and must be purchased separately, along with accessories like the FluxRing Companion Cups and the 1.5 liter FluxRing Cooking Pot and pot support. One canister of fuel is enough to boil 12 liters (or 100 cups) of water. At 14 ounces, the lightweight Jetboil Flash Personal Cooking System has dimensions of 4.1 inches by 7.1 inches, and it is available in a variety of attractive colors, including blue, carbon, gold, violet, green, and sapphire. It typically retails around $100.00 USD, making it the most affordable stove system reviewed in this article, and many consumers report that it is an incredibly good value for the money, and that there is no need to spend more. Another highly rated and extremely efficient Jetboil product, the MiniMo Personal Cooking System is a great choice for the solo adventurer who needs a reliable stove for the duration of his or her adventure. This popular cooking system earned a 2015 Editors’ Choice Award from Backpacker magazine, which speaks to its design and durability. The MiniMo features a redesigned valve and regulator to provide enhanced simmer control, optimized-height cooking cup, a push-button piezo igniter, an insulated drink-through lid, detachable measuring cup, rubber-coated metal handles, fuel canister stabilizer, and a lower spoon angle for ease of eating right from the cup. What must be purchased separately from this unit is the pot support, Jetpower isobutane/propane fuel canister, and accessories such as the coffee press and hanging kit. The sideways burner storage enables the Jetboil MiniMo to be stored easily and compactly. The pride of the MiniMo, however, is its simmer control, which is said to be the best of any stove system on the market. This is thanks to its unique regulator technology and regulator diaphragm, which keeps things at a toasty and even simmer even in temperatures as low as a frosty 20 degrees Fahrenheit. Consumers are very happy with this personal cooking system when it comes to preparing food and beverages for one or two adventurers on the trail, but did note that the igniter often failed. 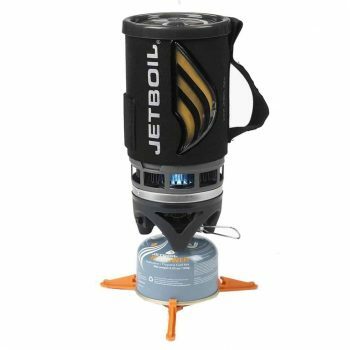 The Jetfoil MiniMo is an especially attractive little stove, and comes in a variety of different colors, including sunset, black, carbon, and camouflage. 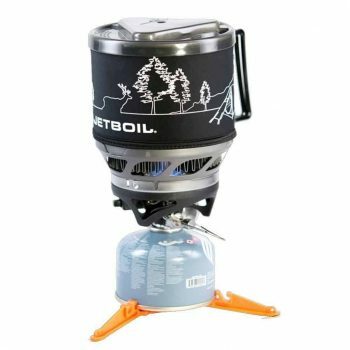 Retailing at approximately $135.00 USD, the Jetboil MiniMo Personal Cooking System falls right in the mid-range in terms of price when it comes to compact backpacking stove systems, which seems right in line with the performance, reliability, design, and construction it offers. The MSR Reactor Stove System is a true product of the famous MSR process, and—for the past decade—it has been a consumer favorite when it comes to efficiency, durability, and reliability. You may find another compact stove system that works perfectly with your needs and preferences, but the MSR Reactor Stove System is undoubtedly an excellent place to start when you’re looking for a cooking system that can keep up with you no matter where your adventures may lead. There’s a reason why the MSR Reactor is such a hit among backpackers and campers. Although, it’s a little bit on the expensive side, the stove offers a great deal of power, efficiency and value for your money. Keeping well-fed and well-hydrated while you hike, backpack, camp, and climb might seem like somewhat of a luxury, but is really quite an essential part of staying healthy and safe throughout the duration of your activities. One can only subsist on trail mix and water for so long; after a while, there is really no substitute for a hot meal after a demanding rainy day or a steamy and robust cup of coffee on a chilly morning at the campsite. No one understands this better than the minds at Mountain Safety Research who bring their years of experience to every item that they develop and test in the actual environs of the sometimes-harsh backcountry. The MSR Reactor is a solid cooking system for just about any outdoor enthusiast. Do you have any personal experience with the MSR Reactor Stove System or other MSR products? Do you have another favorite cooking system we didn’t mention here, and can you tell us why it’s superior? We’d love to hear from you; please share your stories and experiences with us in the comments!